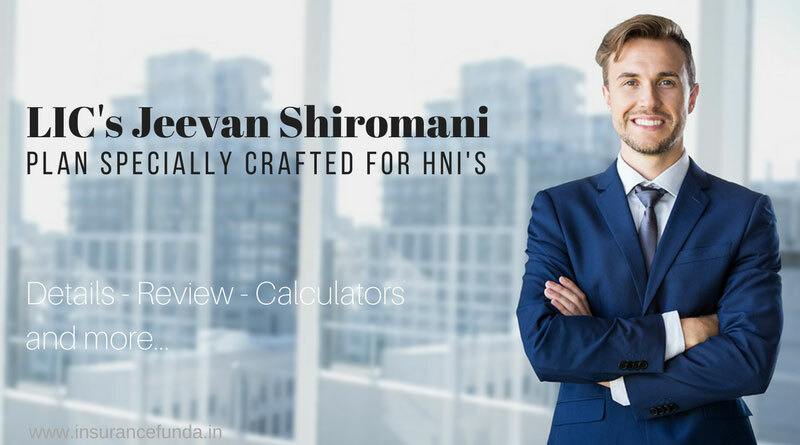 LIC Jeevan Shiromani (Plan 847) – All Details with Premium and Benefit and Maturity Calculators. LIC’s Jeevan Shiromani is a power packed Money back plan specially designed for High Net-worth Individuals (HNI’s). This plan is so unique, with several innovative features which is not available in any other plans from LIC of India. LIC’s Jeevan Shiromani (Plan 847), which can be defined as a non-linked, with-profits, limited premium payment, money back plan is having Guaranteed Additions which is a great feature in the current scenario of dwindling interest rates. Let us have a detailed look at the plan. LIC Jeevan Shiromani (Plan 847) – Key features. Minimum Basic Sum Assured of the plan shall be Rs. 1,00,00,000 (One Crore). Guaranteed Additions at the rate of Rs. 50 per thousand Sum Assured for the first five years and Rs. 55 per thousand Sum Assured for the remaining years of premium paying term, shall be accrued to the policy. The policy shall participate in the profit of the corporation in the form of loyalty additions. Loyalty Additions shall be available at the time of exit from the policy, due to death claim or maturity and is after a premium payment and completion of 5 full years. The plan has an inbuilt Critical Illness Benefit coverage for fifteen specified critical illnesses. Policy term can be opted from 14, 16, 18 and 20 years. Premium paying term will be four years lesser than the term of the plan opted. Survival benefits available under the plan can also be deferred, as per the wish of the policy holder, which adds to the flexibility of the plan. Settlement option for 5, 10 or 15 years shall be available for maturity as well as death benefits under the plan. LIC Jeevan Shiromani (Plan 847) – Eligibility Conditions and Restrictions. Income Tax Rebates 80 C for premium paid and section 10(10D) for maturity, SB and Death Benefits. Loan Loan available after payment of just one year of premium and completion of one year term. The online premium and benefit calculator for LIC’s Jeevan Shiromani plan can give you a clear idea on the premium, income tax benefits, insurance coverage, survival benefits and maturity benefits of the plan as per the parameters supplied by you. You can enter parameters as required and get complete details of the scheme in a compact chart form. In this plan risk will commence immediately from the date of issuance of the policy. The death benefit under the plan varies depending on the period completed. Death occur during the first 5 years of the plan – 125% of the Basic Sum Assured + Accrued guaranteed additions shall be paid. If the death occur after completion of 5 years – 125 % of Basic Sum Assured + Accrued guaranteed additions + Loyalty additions shall become payable. One of the unique features of the ‘Jeevan Shiromani’ is the inbuilt critical illness benefit, which not available in any other plan from LIC of India. On the first diagnosis of any one of the 15 specified critical illnesses, following benefits are available. Lump-sum Benefit equal to 10% of basic Sum Assured which is paid immediately. Option to, defer the payment of premium for a period of 2 years or take Medical Second Opinion at LIC’s expense. List of the critical illnesses covered under ‘Inbuilt Critical Illness Benefit’ are given below. Cancer of Specified Severity – Includes- leukemia, lymphoma and sarcoma. Excludes- tumors carcinoma in situ, benign, pre-malignant, non melanoma skin carcinoma, prostate tumors unless having gleson score > 6, thyroid cancers classified as T1N0M0, lymphotic leukaemia < RAI 3,Non invasive bladder papillary cancer classified as T1N0MO, all tumors in presence of HIV. Open Chest CABG – Excludes – Angioplasty and/or other intra arterial procedures. Myocardial Infraction(First heart attack of specific severity) – Excludes Other coronary syndrome,angina pectoris, rise in cardio biomarkers or Troponin T.
Major organ/Bone marrow Transplant recipient – Includes – Heart, lung, liver, kidney, pancreas which has irreversible end stage failure, Human bone marrow using haematopoietic stem cells. Excludes – Other stem cell transplants. Stroke resulting in permanent symptom – Excludes – Transient ischemic attacks, traumatic injury of the brain, vascual disease affecting only the eye or optic nerve or vestibular functions. Permanent Paralysis of Limb – Loss of two limbs as a result of injury or disease or brain or spinal cord. Present for more than 3 months. Aortic Surgery – Aorta means Thoracic and Abdominal Aorta. Excludes – Minimally invasive or intra arterial techniques. Primary(idiopathic)Pulmonary Hypertension – Excludes – Pulmonary hypertension associated with lung disease, hypoventilation,thromboembolic disease, drugs and toxins diseases of left side of hear, congenital heart disease. Alzheimers Disease / Dementia – Excludes – Non organic disease such as Neurosis, psychiartic illness, alcohol related brain damage. Third degree burns – 20 % of body scarring needed. Benign Brain tumor – Excludes- Cysts, Granulomas, Malformation of arteris or veins of brain, Heamtomas, abscessess, pituitary tumors, tumors of skull bones, tumors of spinal cord. LIC’s Jeevan Shiromani (Plan 847) – Example of benefits. In order to understand the plan better, let us consider an example of a person taking Jeevan Shiromani. Let the details of the person taking the plan be as follows. Read more : Critical Illness Rider from LIC of India – Every thing you need to know.